Bourges Basket have not given up of defending their 2012 LFB regular season title despite all the injury problems. 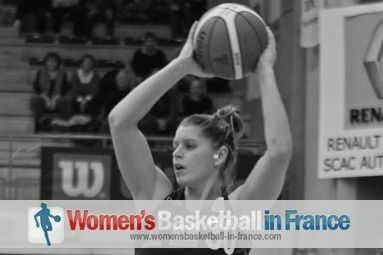 With the help of Great Britain international Jo Leedham Bourges crushed Toulouse Métropole (77-48). Toulouse were on the back foot practically from the tip-off and it took them seven minutes to go in front (11-10). Yet the advantage disappeared with Chalysa Shegog picking up her 2nd foul. Bourges stepped on the acceleration to finish the first quarter with an 8-0 run to edge the first quarter (18-14). For the first three minutes of the second quarter, Toulouse played their basketball and were back on level terms (22-22). Jo Leedham - who had 4 points in the first quarter - and Céline Dumerc then launched Bourges Basket into a 13-0 run. By the end of the first half Leedham had 8 points from a perfect 4-from-4 while Dumerc had 5 points and 4 assists as their side led (37-24). Bourges Basket dominated the third quarter 24-10 to end the game as a contest. Leedham herself continued her personal festival and hit a couple of shots from behind the arc. Leedham finished the game with 16 points and her only miss came after picking up an offensive basketball when she tried to put it back into the basket during the final quarter. Nwal-Endéné Miyem and Styliani Kaltsidou both had 11 points while Christelle Diallo had 10 points. Stephany Skrba was a perfect 4-of-4 for her 8 points. Toulouse's offensive came mainly from Shegog and Carrem Gay with 19 and 10 points respectively. However their main problem in this game was rebounding. They managed to pick up 18 whereas Bourges won 32 which included 10 on the offensive end. With this win in the LFB regular season Bourges Basket move one game closer to Lattes Montpellier at the top of the regular season standing while Toulouse remain in mid-table. Just follow this link for the news and stories from all the other games from round 18 of the Ligue Féminine de Basketball.